FREE Nutrition Workshop: What Can I Eat? 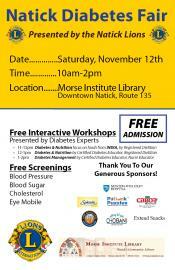 INDIA Saturday, Nov. 12 11am-12noon. Each participant will receive a free "What Can I Eat? INDIA" Potluck Puzzle Discussion Book. Workshop will be facilitated by Prasanna Navarasam, Registered Dietitian. Prasanna has studied nutrition in both India & USA and currently works as a clinical RD in Framingham. The workshop will be based on a Potluck Puzzle Discussion Book and emphasis will be on the questions and comments of participants. Please join us for this workshop & many more fun & educational opportunities throughout the fair which runs from 10am-2pm. Location: Leonard Morse Institute Library, Natick Center, Route 135. Submitted by potluckpuzzles on Wed, 10/19/2011 - 01:26. WHAT CAN I EAT? is the second Discussion Book™ on prediabetes/diabetes offering a new, fun, interactive educational tool to help people with prediabetes/diabetes make good choices and we invite you to use them in your health care plan. WHAT CAN I EAT?, has a strong focus on NUTRITION and thoughtfully helps people with prediabetes/diabetes look at how they currently eat and by the end of the book, what they can do differently to help prevent and control diabetes.